This post is sponsored by Member’s Mark 3-Ply Facial Tissue. My kids already had one cold this season which told me one thing- it was time to stock up on goods for cold and flu season sadly. To me, when you are sick or your kids are sick, one of the worst things is to not have the supplies that you need and having to go to the store when you aren’t feeling well. During the fall and winter months, I always keep stock of different things so that when sickness hits, we are prepared with what we need and can just focus on getting better ASAP. When the kids or I am sick, these are some of the things that we like to eat that I keep in the pantry: noodle soup, saltine crackers and applesauce. Other items that I do not always stock but can be helpful during an illness are different types of soup, bananas, toast and one kind of juice or electrolyte drink. Typically, we don’t drink juice or electrolyte drinks much but when the kids are sick, I find that they really help encourage the kids to drink more. Hydration is super important when you are sick to help you feel better and anything that helps my kiddos, I’m all about. When you have a cold, you need great facial tissue in quantity. I like the NEW Member's Mark 3-ply facial tissues. I keep these all over my house for when I need them. I like having a box in my bedroom, one in the car and one in my family room. I also keep a few individual tissues in my pockets. It’s the worst being without a tissue when you have a runny nose and need one stat. 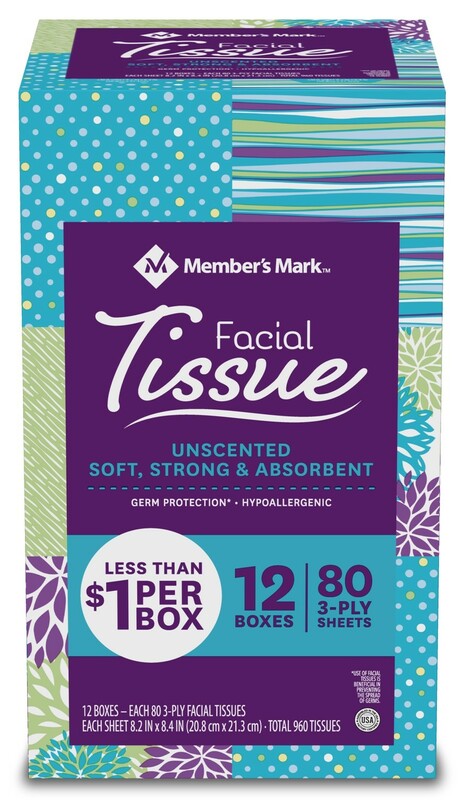 I always make sure to choose quality facial tissues because I often get a red spot under my nose when I have a cold from rubbing and need a gentle tissue and these ones are great. They come in a 12 pack at Sam's Club and are literally less than $1 a box! You get 960 tissues in a pack which should last all through the year. We use Member's Mark toilet paper and like these facial tissues as well. My husband is a teacher and these are great for his classroom also. This tissue is thick and gentle yet very strong. When I'm sick, I want to drink tons of tea. I mostly go for decaf teas and herbal blends. Again, fluid is super important when you're sick and a hot cup of tea feels great when you are under the weather. Adding in lemon or orange provides some extra vitamin C.
Although I hate to admit it that we will get sick by stocking up on medications, saving a trip to the drugstore when you're sick can feel like a lifesaver, especially when sickness hits in the middle of the night. These are the medications that we use for the kids: ibuprofen and acetaminophen. For us, I like having cough drops, cough medicine, non-drip spray, decongestants and nighttime medication for cold and flu since I have a ton of trouble sleeping when I'm sick. We keep these up high in our house in a bin so we know exactly where they are when we need them and so that the kids can't get anywhere near them. When you or your kids are sick, the last thing you want to have to deal with when you want to take their temperature is a thermometer that doesn't work well. Trust me, there has been much panic in my house regarding having junky thermometers that die quickly or give inaccurate results. We finally invested in a good one that works when we need it to. I like the one that takes about 2 seconds to scan across your forehead. What do you always stock up on for cold and flu season? Here’s a sneak peek of the Spring/Summer box hitting the shelves of Sam's Club soon! This is a sponsored post written by me on behalf of Member’s Mark 3-Ply Facial Tissue.